Until now IT was used to maintain the standardization of hardware, operating systems and programming languages to reduce the maintenance cost, ease of hiring professionals, greater control over the documentation, methodologies used, ease of implementation processes contingency and business continuity. 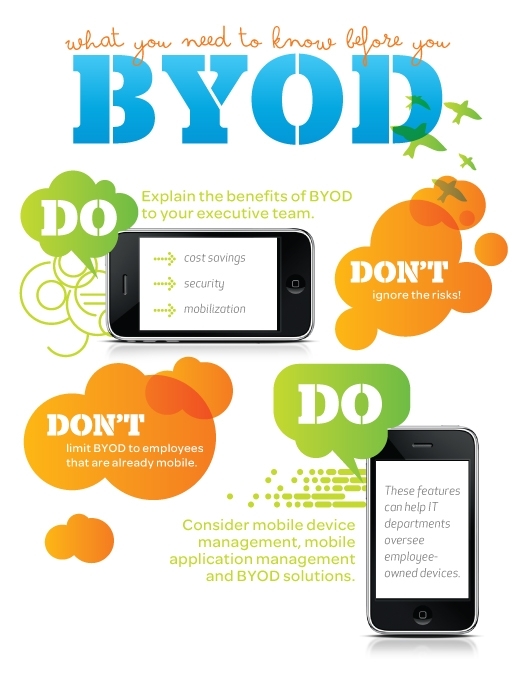 But the BYOD trend came strong and we need to review several of these concepts, especially because of the lack of standardization. – The support departments need to specify a service catalog. – The Security Policy of the company must be respected. For this reason, all devices must be registered and submitted to the Compliance Review. – The Service Desk will need to clarify whether only act on what is owned by the company or whether it will provide unrestricted support for particular devices and why this or that support model was chosen. It is necessary to significantly increase the ability of self-service customers.